Create a new map that's designed to import data from a file (data can only be imported to a new map). Click Select file and select the file that you want to import data from (you can perform a one-time data import from a single file). The contents of the selected file will be automatically verified for compliance with technical limitations. CSV or XLSX files must follow a specific template. You can open this template by clicking the appropriate link at the bottom of the window or find it in the CSV or XLSX sections. After the import process has completed, data from the file you selected will display on the map you created and may be edited and saved. If the file's metadata stores map names and descriptions, they will also be imported. If the source file contains groups, they will not be saved. The item color will be the closest to the original that is supported by Map Constructor. Download the sample file at this link: Sample KML file. You can also read about the KML format in the Exporting map items section. When you import data from a GPX file, placemarks are added to the map (coordinates, description, label), along with routes and tracks. 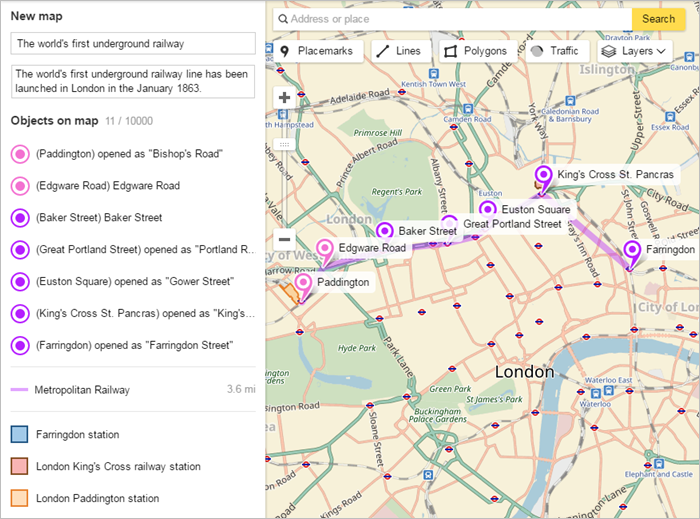 You can also read about the GPX format in the Exporting map items section. 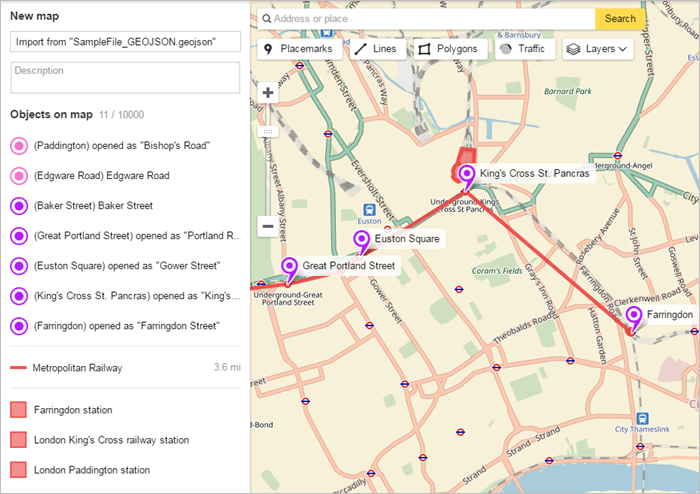 When you import data from a GeoJSON file, placemarks (coordinates, description, label, number, color), lines (everything that can be set using the Constructor) and polygons (everything that can be changed using the Constructor) are added to the map. Download the sample file at this link: Sample GeoJSON file. 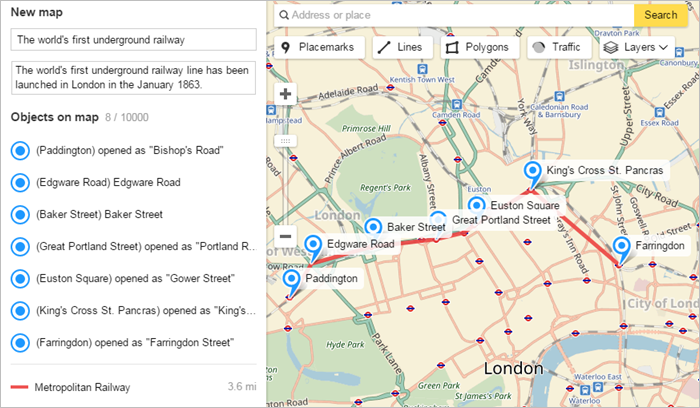 You can also read about the GeoJSON format in the Exporting map items section. When you import data from a CSV file, only placemarks (coordinates, description, label, number) are added to the map. Commas, semicolons, or tabs can be used as delimiters. 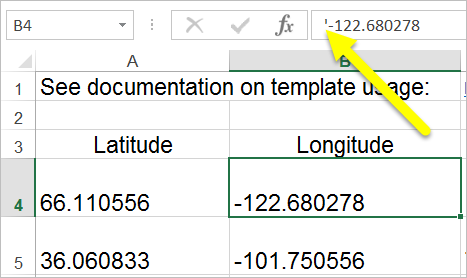 The “Latitude” and “Longitude” fields must be filled in. All other fields can be left empty. Coordinates are given in decimal format, where the integer and decimal parts are separated by a point. It's preferable to enclose the text value of the label and its description in quotation marks. This is so that the system ignores characters that look like file delimiters. If text in the Description or Label fields contains quotation marks (for example, if your store is located in Russia where formal names are often set off in "quotes"), then enclose that text in quotation marks as well. Example: If the label should be "World of Seeds" store, then write the value in the file as """World of seeds"" store". 51.530216469900985,-0.12356737902929697,"at the opening of "King's Cross"","King's Cross Saint Pancras","162". Download the template at this link: CSV template. 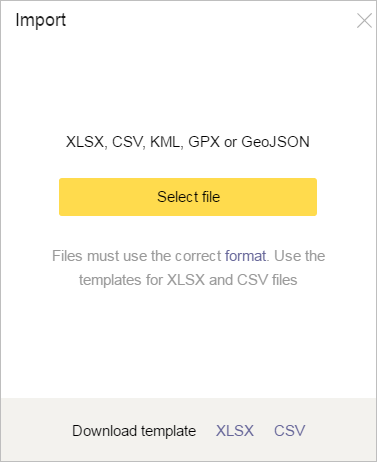 When you import data from a XLSX file, only placemarks (coordinates, description, label, number) are added to the map. Otherwise MS Excel interprets the entry as a formula, which results in an error. Download the template at this link: XLSX template.